A great way to know if you have performed a complete warm-up properly is to determine your post warm-up target heart rate. To do this, you will want to see that your heart rate is around 50 – 60% of your maximum heart rate (MHR). For a more accurate MHR, use the Karvonen Formula. Click here to view a Karvonen Heart Rate Calculator (Optional). Example: Susan is a 30 year-old female. To determine her MHR, she would simply subtract 30 from 226. Her MHR is 196 beats per minute (BPM). The target heart rate immediately following a warm up routine will be around 50 – 60% of her MHR. Using Susan’s MHR of 196 BPM, we will determine her post warm-up target heart rate. Susan’s post-warm-up target heart rate is between 98 and 118 BPM. Now that you know how find your post warm-up target heart rate, how do you determine your heart rate in general? A simple way to do this manually is to count your pulse beats in 15 seconds and multiply it by 4. 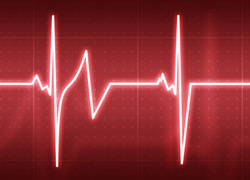 For more accurate results, count your pulse beats in 60 seconds. For example, if you count 25 pulse beats in 15 seconds, your heart rate is 100 BPM.